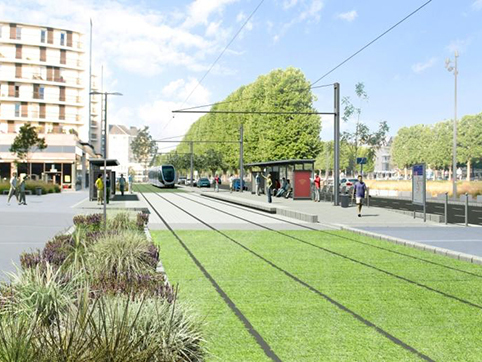 Rendition of Caen’s proposed LRT tramway that will replace problematic guided-BRT system. Graphic: Caen municipality. When the “tram on tyres” or “rubber-tired tramway” technology first emerged in the early 2000s, it was positioned as part of the new Bus Rapid Transit (BRT) concept attracting interest at the time. The argument went that “BRT” was “just like light rail, but cheaper”, and the “rubber-tired tramway” was intended to demonstrate that a “tram” constructed with automotive/bus technology could be “guided” just as a light rail transit (LRT) tramway was guided by its track rails, and able to operate extra-long, multi-articulated buses smoothly and reliably just like the tramcars on LRT railways. A number of cities have experimented with or adopted the technology, particularly in France, where cities like Nancy, Clermont-Ferrand, and Caen made the “tram on tyres” the centerpiece of their transit systems. Now, plagued by reliability and performance problems, Caen is clearly fed up with it, and has launched a project to convert to a standard LRT tramway — running on bona fide tracks — by 2019. Caen guided BRT (“rubber-tired tramway”) system, now scheduled for replacement by LRT. Photo: TendanceOuestRouen.com. However, reliability problems with the technology (especially derailments of the guidewheels) reportedly have persuaded Caen’s political leadership and transit management to ditch the guided-bus system. In the new LRT tramway plan (see graphic simulation at top of post), 16.8 km (10.4 miles) of LRT routes will replace (and slightly extend) the guided-bus routes, and tracks will replace the paveways (or be embedded in some sections of pavement). 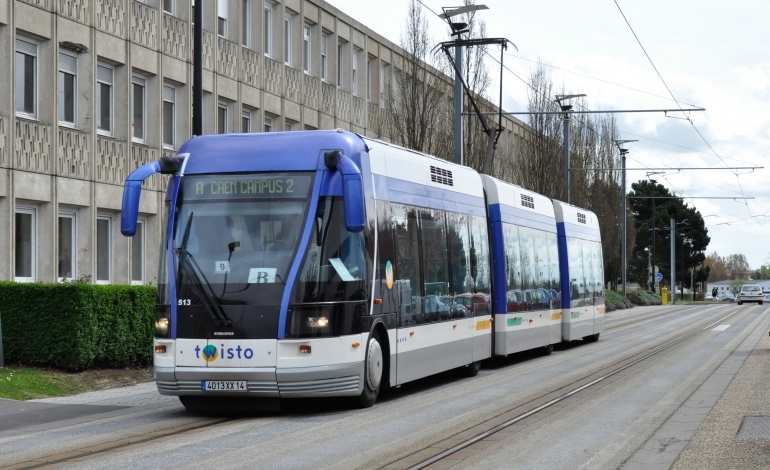 A fleet of 23 trams is projected to replace the BRT buses, with a total project cost estimated at €247 million (currently about $269 million, or about $26 million per mile). Project completion is aimed for 2019. I found the system at Caen and also the one at Nancy to be a solution in search of [a] problem. While there must be some economies from installing just a guide rail instead of double-railed load bearing track looking at the system in [situ] I would have to ask if the guide rail is needed at all. The vehicles are long and do turn some sharp corners but I’m still not sure if they would be beyond a competent driver and a well-constructed articulated bus operating without a guide rail. A friend and I recently visited Caen and were shocked, stunned, and amazed as we watched and rode these weird vehicles. We found they were speedy, but fairly noisy, and seemed to do the job well, although they rode more like a trolleybus rather that a tram, in particular with a lot of vertical perambulations and rear end whip as they rounded corners at speed!! One point that was obvious is the fact that because the vehicles follow exactly the same part of the road without any deviation for cut in or out, … the road surface in some areas is becoming badly damaged particularly at some of the stops where it was noted repairs have had to be made. Even the smallest pothole will deteriorate rapidly and every tyre on every bus will hit that spot in exactly at the same place every ten minutes or so. They basically will have a system of elongated trolleybuses camouflaged as “trams”, with lots of gadgetry to keep the buses on course. They will have a central slot to deal with in the middle of the paveway (tending to collect rain, mud, etc.). And they will be persistently trying to solve lots of operational challenges over the next months and years to prove the whole thing works. Thus one can safely predict that Nancy will be expending a lot of its planning and administrative energy trying to solve the challenges of making a trolleybus system mimic the performance of an LRT system. There’s a recurring question: Why bother at all with the guide rail in the slot? it is dubious whether such an arrangement will permit higher vehicle speeds, although Nancy designers seem to think their bus will run a bit faster in a narrow right-of-way if it’s guided in this fashion. One is tempted to suspect that the extra-long, multi-articulated bus benefits from having its axles guided by such a mechanism, possibly minimizing any misalignment of the rear section while in the guideway (which might explain why the vehicle tends to “fishtail” when free-running). And beyond the question of whether it’s worthwhile trying to imbue a bus with LRT characteristics, there’s another issue as well. Once a transit agency or government entity buys into an entire, specific “guided-bus” technology, its planners and decisionmakers commit to a specialized guideway and technical infrastructure using one form or another of specially designed curbs, below-pavement conduits, special travel lane markings, etc. That might happen after the initial order of vehicles, where competition is alive and well, and the initial bidding environment may be fairly competitive among a number of vendors. In contrast, imagine instead that the transit agency set down a few miles of steel rails with 1435 mm (standard) track gauge with readily available, dependable track switches, and mature signalling technology. The agency buys a couple of dozen light rail vehicles which have a lifespan of 30 to 50 years with trainlined controls so that one operator can control two to four cars. When it’s necessary to expand that system or replace the vehicles, the agency will find at least half a dozen suppliers lined up who can make cars which will work fine with the previous generation. Productivity is better, competition is alive and well, and the technology is mature.